Two large samples were collected to evaluate the structure of traits in the temperament domain. In both samples, participants were administered random subsets of public-domain personality items from a larger pool of approximately 700 items. These data broadly cover the most widely used, public-domain measures of personality (though this breadth is not likely free of theoretical bias). When combined with a third, previously-shared dataset that used the same methodological design , the sample includes more than 125,000 participants from more than 220 countries and regions. Re-use potential includes many types of structural, correlational, and network analyses of personality and a wide range of demographic and psychographic constructs. The data are available in both rdata and csv formats. Data were collected between July 26, 2014 and February 7, 2017 in two waves. The first was collected between July 26, 2014 and December 22, 2015 (denoted below as the “Replication Sample”) and the second was collected between December 22, 2015 and February 7, 2017 (the “Confirmatory Sample”). These samples are related to a third dataset that was previously uploaded to Dataverse on July 6, 2015 and described in . Those data were collected between December 8, 2013 and July 26, 2014. Collectively, these three samples represent approximately 1,150 days of uninterrupted cross-sectional survey data collection using the Synthetic Aperture Personality Assessment (“SAPA”) technique. The SAPA Project is a collaborative online data collection tool for assessing psychological constructs across multiple domains of personality. These domains – temperament, cognitive abilities, and interests – have been chosen based on historical and current prominence in the field of individual differences research. The primary goal of the SAPA Project is to determine the combined and independent structures of each of these domains based on the collection of large, cross-sectional, online samples. Secondary goals include (1) the identification of additional domains (e.g., motivation, character, values) which may also provide insight into the ways that individuals differ; and (2) an improved understanding of the demographic and psychographic correlates of individual differences in personality. The data described here were collected in order to evaluate the structure of personality constructs in the temperament domain. In the context of modern personality theory, these constructs are typically construed in terms of the Big Five (Conscientiousness, Agreeableness, Neuroticism, Openness, and Extraversion). While several large scale studies of personality have been conducted using trait descriptive adjectives and nouns (see  and ), relatively few attempts have been made to evaluate large sets of phrased items even though phrased item types are more typically used in personality assessments. Items from approximately 400 public-domain personality scales were included in this data set; most of these were chosen explicitly because they are among the more widely-used personality measures. They were not chosen based on any a priori hypotheses regarding the underlying structure of self-report items, nor should it be expected that these items represent an unbiased or representative snapshot of human personality; the structure of these items will, to some extent, reflect the shared characteristics of the scales from which they were taken. It should be noted that the research design used to collect the two samples described herein (the Replication and Confirmatory Samples) was first described in the PhD dissertation of the first author , though these samples both have considerably more participants than the original sample (the Exploratory Sample). All three data sets were used to develop the SAPA Personality Inventory  and it is likely that other researchers who are interested in re-using these data would want to combine all three samples. Participants in both datasets (Replication Sample N = 54,855, Confirmatory Sample N = 48,350) completed an online survey in exchange for feedback about various aspects of their personality. No active advertisements or marketing efforts were used to attract participants for this data collection; web traffic statistics (collected through Google Analytics) suggest that participants who did not come to the website directly were directed to it through links from various other websites about personality, personality research, general psychology topics, and psychometrics. Many of these websites were academic/educational in nature. The data contain many demographic and psychographic variables. These include: gender (62% and 63% female in the Replication and Confirmatory Samples, respectively); age (see Figures 1.1 and 1.2); marital status (see Figure 2); country (219 countries  were represented in the Replication Sample and 220 in the Confirmatory Sample; the number of countries with more than 50 participants was 50 and 48 in the Replication and Confirmatory samples, respectively; 68.7% and 66.5% of participants were from the United States); state/region (for 32 of the countries); ZIP code (postal codes for U.S. participants only); race/ethnicity (see Figure 3); educational attainment level (see Figure 4); employment status (see Figure 5); and parental field of employment (for 1 or 2 parents). Participants were not required to provide any of these data except age and gender. Participants by age and gender in the Replication Sample (males in blue, females in red). 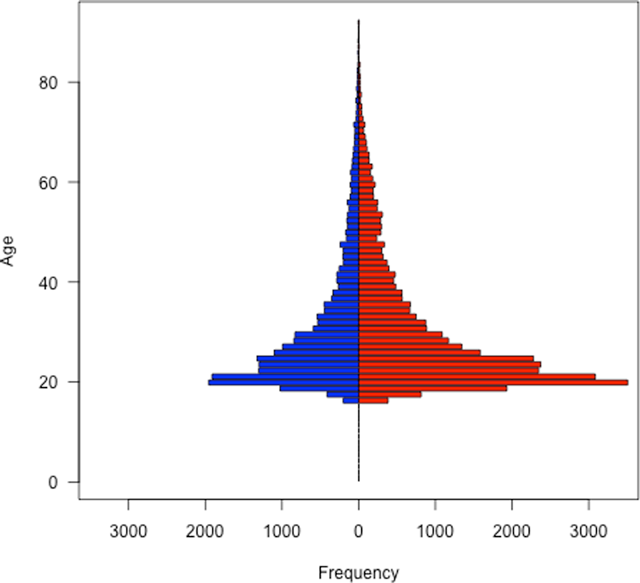 Participants by age and gender in the Confirmatory Sample (males in blue, females in red). Distribution of marital status across ages in the U.S. Census and the Exploratory, Replication, and Confirmatory samples. Distribution of race/ethnicity across ages in the U.S. Census and the Exploratory, Replication, and Confirmatory samples. Distribution of educational attainment level across ages in the U.S. Census and the Exploratory, Replication, and Confirmatory samples. Distribution of employment status across ages in the U.S. Census and the Exploratory, Replication, and Confirmatory samples. Civilian labor force excludes anyone who is retired, a student, a homemaker, in jail, in an institution, or not seeking work. All of the personality items administered in both samples are public-domain items and the majority of these are items from the International Personality Item Pool [10, 11, 12]. The items were primarily chosen based on their inclusion in at least one of eight sets of self-report personality scales. Seven of these eight sets of scales are available in the International Personality Item Pool, including: (1) the 100 IPIP items corresponding to the Big Five factor markers [9, 10]; (2) the 100 items of the Big Five Aspect Scales ; (3) the 240 items of the IPIP-HEXACO inventory ; (4) the 48 items of the Questionnaire Big Six scales ; (5) the 300 items of the IPIP-NEO ; (6) the 127 items of the IPIP-Multidimensional Personality Questionnaire [10, 21]; and (7) the 40 items of the Plasticity/Stability scales . The eighth set of scales included 79 items adapted from the Eysenck Personality Questionnaire – Revised . Note that the format of these items was modified by the first author to match that of the IPIP items and that the 21 “lie” scale items were intentionally omitted. Administration of these scales also implies the administration of many other measures which are fully or partially overlapping, including abbreviated versions such as the 24 and 36 item Questionnaire Big Six scales , the 50 item IPIP scales corresponding to the Big Five factor markers , and the 20 item “mini- IPIP” scales . The 1,034 items from these eight targeted measures contain 338 duplicates, resulting in a total set of 696 unique items. Of these, 473 items are in only one set of scales, 126 items are included in two sets of scales, 54 items are in three, 22 items in four, 17 items in five, and 4 items are in six of the seven sets of IPIP-based scales (“Have little to say”, “Worry about things”, “Like order”, and “Have a rich vocabulary”). All of the items were administered with the same six response options (“Very Inaccurate”, “Moderately Inaccurate”, “Slightly Inaccurate”, “Slightly Accurate”, “Moderately Accurate”, “Very Accurate”). The items were administered using the Synthetic Aperture Personality Assessment (“SAPA”) technique , a variant of matrix sampling procedures discussed by Lord . This method produces data which contain “massive missingness” by design . This missingness qualifies for classification as missing completely at random [“MCAR”, 13] and it is further described as massively missing because the mean level of missingness by participant was 85.7% and 85.9% respectively for the Replication and Confirmatory Samples. The personality items were presented to participants in random order, and participants responded to as many items as they wished. Participants were encouraged to complete approximately 100 items but were able to complete up to 330. Table 1 describes the size and density of personality data in all three samples. Variability in the number of responses was generally consistent across all three samples. The mean number of responses per participant ranged from 84.7 to 86.1 (SDs ranged from 57.2 to 58.7). Given this similarity in density, differences in the number of responses per item and in the number of pairwise responses were largely reflective of differences in the number of participants. Overview of the Size and Density of the Samples. Partial removal of data collected from participants who completed the survey more than once in a single browser session. This was done by assigning participants a random user ID that was persistent as long as their current browser session remained active. In those cases where more than 1 response set was entered in a single browser session, only the first response set was kept. Removal of participants with self-reported ages younger than 14 and older than 90. The survey is not intended for participants younger than 14. Self-reported ages over 90 were removed on the grounds that they were deemed to be unlikely. No personally identifying information were collected from participants in these data. For use with R statistical software systems , the data files are named: ‘sapaTempData696items26jul2014thru22dec2015.RData’ and ‘sapaTempData696items22dec2015thru07feb2017.RData’. The data files are named to indicate the domain (temperament), the number of items included (696), and the time period over which the data were collected (26 jul 2014 through 22 dec 2015 and 22 dec 2015 through 07 feb 2017). The files can be found at: https://doi.org/10.7910/DVN/GU70EV (Replication Sample) and https://doi.org/10.7910/DVN/TZJGAT (Confirmatory Sample). The two data files each include four objects. The most pertinent of these is the raw data object (‘sapaTempData696items26jul2014thru22dec2015’ or ‘sapaTempData696items22dec2015thru07feb2017’). The remaining three objects, which are identical in each data file, are helper files for data analysis: ‘ItemInfo696’ is a data dictionary which provides the text for each of the temperament items and a listing of the scales with which it is associated, ‘ItemLists’ is a list object that provides an index of all the temperament items associated with each measure, and ‘superKey696’ is a scoring matrix for the many personality scales which can be scored based on these data. The data have also been posted in a csv format at the same locations listed above. Each of the objects described above has been saved as a separate csv file, with the exception of the ItemLists because this is not easily reorganized into a spreadsheet format and could be easily re-created from the superKey csv file. Self-report, cross-sectional survey data from 103,205 participants (54,855 participants from the Replication Sample and 48,350 from the Confirmatory Sample). The data are stored as separate sets of rdata files (approximately 10 MB each). Each file includes the four objects described above: the main data object, either ‘sapaTempData696items26jul2014thru22dec2015.rdata’ for the Replication Sample or ‘sapaTempData696items22dec2015thru07feb2016.rdata’ for the Confirmatory Sample, as well as ‘ItemInfo696’, ‘ItemLists’, and ‘superKey696’. It should be noted that several of the scales in these measures require reverse coding of some items; see the original documentation of each measure for more details. In addition to the rdata file containing these four objects, there is also an associated text file that provides full information on the demographic codes (‘demographic codes.txt’). In addition to the authors, Lorien Elleman, Jason French, Elina Zaonegina, Zara Wright, and Sarah Russin contributed by helping to maintain the website and increase its visibility. All aspects of the survey and website were written in English. Data collected about the website through Google Analytics suggests that some participants used browser-based translation software, but no specifics are available about the extent and effect of these translations. The data have been deposited under the open license CC0 (Public Domain Dedication). The data are freely available for use with appropriate citation. The data were published on Dataverse (https://dataverse.harvard.edu), within a separate dataverse for datasets relating to the SAPA-Project (https://dataverse.harvard.edu/dataverse/SAPA-Project). The Replication Sample is located at: https://doi.org/10.7910/DVN/GU70EV and the Confirmatory Sample is located at https://doi.org/10.7910/DVN/TZJGAT. The datasets were published on February 25, 2017. The data are well-suited for many types of structural, correlational, and network analyses of personality. These might include evaluations based on one of the many measures independently, the ways in which these measures relate to one another, exploratory evaluations of their shared structure, and evaluations of structural relationships across constructs in various groups of participants (e.g., based on age, gender, country/region, educational attainment levels, etc.). The large number of both participants and items also make it possible to construct novel scales based on the empirical correlations between items and criterion variables (see the ‘bestScales’ function and related help pages in the psych package  for examples of these techniques). Additional, non-overlapping data sets from the SAPA Project are also available for use; contact the authors for more information. The authors would like to acknowledge Joshua Wilt and Jason French for their contributions on the SAPA-Project. David M. Condon, PhD, an Assistant Professor at Northwestern University’s Feinberg School of Medicine in the Department of Medical Social Sciences. His contribution included a primary role in the technical development of the website through which these data were collected (sapa-project.org). This involved the adaptation of existing code (primarily generated by the third author for previous data collection projects) and the authorship of new code (for extending the functionality and aesthetic design of the website and for improving the data storage and data exportation methods). The first author also took the lead role in cleaning the data to prepare it for sharing, making the data available in the Dataverse, and preparing and submitting this manuscript. Ellen Roney, is a Research Assistant at Northwestern University’s Feinberg School of Medicine in the Department of Medical Social Sciences. She contributed substantially to the preparation of this manuscript, including the production of the tables and figures, editing text, and preparing the data to be shared in the Dataverse. William Revelle, PhD, is credited with first implementing the survey sampling techniques that made this data collection possible (SAPA) and for developing earlier incarnations of the survey, as described on his website (personality-project.org). He also owns the url for the website where these data were collected (sapa-project.org). The third author played a secondary role in the development and maintenance of the website used to collect these data. Condon, D M (2014). An organizational framework for the psychological individual differences: Integrating the affective, cognitive, and conative domains. PhD thesis. Evanston, IL: Northwestern University. Condon, D M (). The SAPA Personality Inventory: An empirically-derived, hierarchically-organized self-report personality assessment model In: (under review). Goldberg, L R (1999). “A broad-bandwidth, public domain, personality inventory measuring the lower-level facets of several Five-Factor Models” In: Mervielde, I, Deary, I, De Fruyt, F and Ostendorf, F eds. Personality and Individual Differences. The Netherlands: Tilburg University Press, pp. 7–28. Goldberg, L R (2014). “International Personality Item Pool: A scientific collaboratory for the development of advanced measures of personality traits and other individual differences”, Retrieved from http://ipip.ori.org/ [January 18, 2014]. International Organization for Standardization (2013). Codes for the representation of names of countries and their subdivisions. Part 1: Country codes In: Geneva (Switzerland): The Organization. (ISO 3166-1: 2013). John, O P and Srivastava, S (1999). “The Big Five trait taxonomy: History, measurement, and theoretical perspectives” In: Pervin, L and John, O P eds. Handbook of personality: Theory and research. New York: Guilford Press, pp. 102–138. R Core Team (2015). “R: A Language and Environment for Statistical Computing”. Vienna, Austria: R Foundation for Statistical Computing. ISBN 3-900051-07-0. Revelle, W (2016). “psych: Procedures for psychological, psychometric, and personality research”. Evanston, Illinois: Northwestern University. R package version 1.6.12. Revelle, W and Brown, A (2013). “Standard errors for SAPA correlations” In: Society for Multivariate Experimental Psychology. St. Petersburg, FL, pp. 1–10. Revelle, W, Condon, D M, Wilt, J, French, J A, Brown, A and Elleman, L G (2016). Web and phone based data collection using planned missing designs In: Fielding, N G, Lee, R M and Blank, G eds. Handbook of Online Research Methods. Thousand Oaks, CA: Sage Publications.